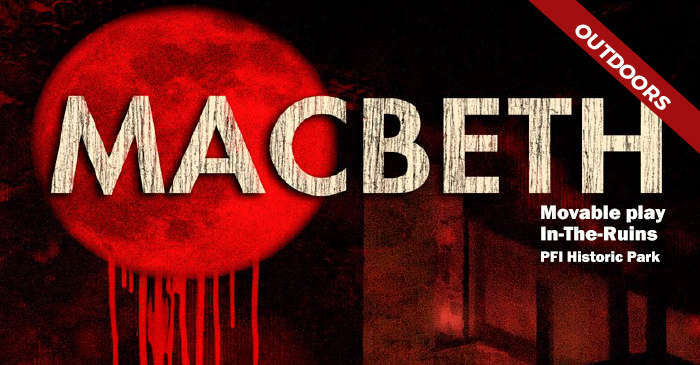 The horror and the poetry of this supernatural tragedy are magnified as the moon rises over Macbeth’s castle – represented by the stone walls of the Patapsco Female Institute in Ellicott City. You’ll be up close to the action as you travel with the actors through the park. Subscribers enjoy first dibs on movable Macbeth tickets: Get them now: For movable plays, audience size will be limited each night. 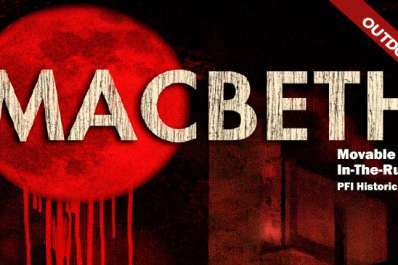 Macbeth is an add-on play; it is not a subscription series choice. Individual tickets go on sale August 6. Audience size will be limited for the movable play, as we want the crowd to enjoy the full experience of being up close to the traveling action. We encourage advance purchase of tickets. PICNIC! We welcome groups and preshow receptions in the park starting 90 minutes before showtime. Picnic tables for six, and cafe tables-for-two, are available for rent. Please note that “movable” plays travel through the park with the audience walking alongside, so a table rental is a great way to share a preshow picnic but does not provide a view of the play. Table rentals are separate from ticket purchases.